Avgolemono is the excellent Greek sauce that has no equal, it is the finest, most delicate and delicious sauce you can taste. It can transform the plainest soup or casserole into a meal that is divine. Avgo meaning egg and lemoni meaning lemon, are the 2 ingredients that this sauce is made of, which is then added to a liquid such as stock. 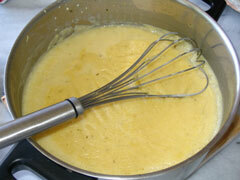 Simple, yet using quality ingredients it can create a creamy lemon scented sauce. This is probably the only sauce that the Greeks will use to enhance their food. 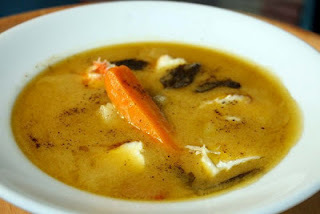 It is often added to fish meals with a soup, chicken and lamb dishes such as chicken soup, lamb or chicken fricassee. It is an easy sauce to make, although you must take care when adding to the hot liquid of a meal, as it can set the eggs if you’re not careful. When your meal is ready for the egg and lemon sauce to be added, remove the pan from the heat for 5 or 10 minutes and add 2 or 3 tablespoons of cold water to the bubbling pot to reduce the chances of the eggs setting. It must never be added to the liquid whilst it is still boiling. 2-3 eggs is the usual amount to use, although depending on the quantity of the dish you are making, you would not use more than 1 egg per two persons. You can adjust the lemons slightly, but the whole purpose of this sauce is the tangy, fresh scented taste of the lemons, so do as the Greeks do and don’t skimp on the lemons. It’s best to separate the eggs and using an electric mixer, beat the egg whites in a bowl. Add the egg yolks and beat briefly until mixed. Add the lemon juice gradually and beat until combined. Although this method is a little time consuming, it helps safeguarding the eggs from curdling when added to the hot liquid. Alternatively, beat the eggs well without separating and then add the lemon juice and beat together. Gradually add 6 or 7 tablespoons of the hot (but not boiling) sauce to the egg and lemon mixture, beating in with each tablespoon. This is done slowly to gradually bring the egg mixture up to the warm temperature of the dish. Now pour this sauce into the contents of the saucepan, shaking the pan to get the sauce as mixed in as possible. 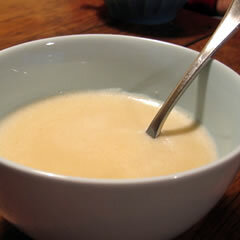 Very carefully stir the avgolemono sauce until just combined with the contents of the saucepan. Return the pan to a gentle heat for a few minutes until the sauce is warmed.